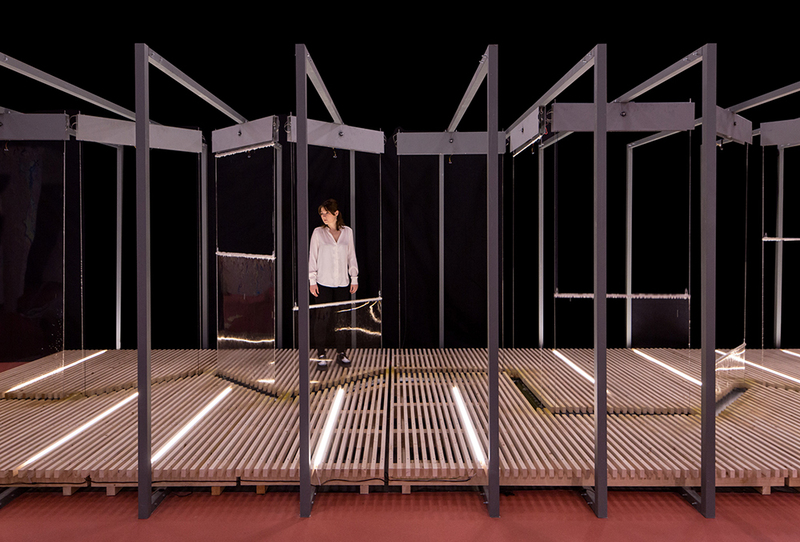 https://vimeo.com/273390191 Presented at the Venice Architecture Biennale, Automatic Architecture examines the space of automation and algorithms in architecture through two projects, Wall and Space. The projects were realized as part of a workshop led by Riccardo Blumer at the Academy of Architecture at the University of Italian Switzerland in Mendrisio, Switzerland with support from U.S. non-profit MADWORKSHOP. Automatic Architecture presents two different collaborative projects. Walls is a series of roboticized bars pulling planes of soap bubbles, stretching them to their physical limits until they lost their form. “It contemplates a space in which tangible walls can be there one minute and gone the next,” as Blumer says in a video produced on the project by PLANE—SITE. The 11 rods that stretch out the panels of the wall begin together but invariably fall out of sync with one another as they attempt to create a complete, continuous wall. Defined by its ephemerality, Wall generates a space that “simultaneously does and doesn’t exist.” Walls is a collaboration between Lorela Arapi, Stefano Clerici, and Andrea Cappellaro. Space presents a grid of automated blocks that rise and fall in a constantly shifting pattern determined by an algorithmic model that can run without repeating a form for 250 years, suggesting that architecture is itself constantly in flux and highlighting the tension between order and expression. Space was created by Georgios Voutsis. The MADWORKSHOP Homeless Studio, taught by University of Southern California faculty Sofia Borges and R. Scott Mitchell, spent the fall 2016 semester exploring how architecture students can use their skills to address the growing homelessness crisis in Los Angeles. The studio was funded by MADWORKSHOP, a nonprofit started by David and Mary Martin of the A.C. Martin family in 2005 to bridge the classroom and real world architectural experiences. This semester, the group explored the architectural manifestations of homelessness in order to have students postulate solutions aimed at re-housing individuals. For their first assignment, students combined off-the-shelf and found materials into mobile “nomadic shelters.” One group repurposed the chassis of a shopping cart, adding telescoping plywood platforms to create covered sleeping surfaces. Two prototypes are designed for bicycle transport: One, a generous box on wheels, utilizes welded aluminum sections for structure and infill panels made of wood and corrugated plastic, while a second works as a mobile bed with a retractable plywood roof wrapped in canvas drop cloth. Others are designed as pushcarts that facilitate fully reclined sleeping positions, with drop-down, accordion-hinged hatches or telescoping pod sections. The prototypes convey a keen sense of appreciation for the dexterity with which transient populations live their day-to-day lives: The compartments on each prototype can lock shut and are designed to be packed up in a few minutes using minimal labor. 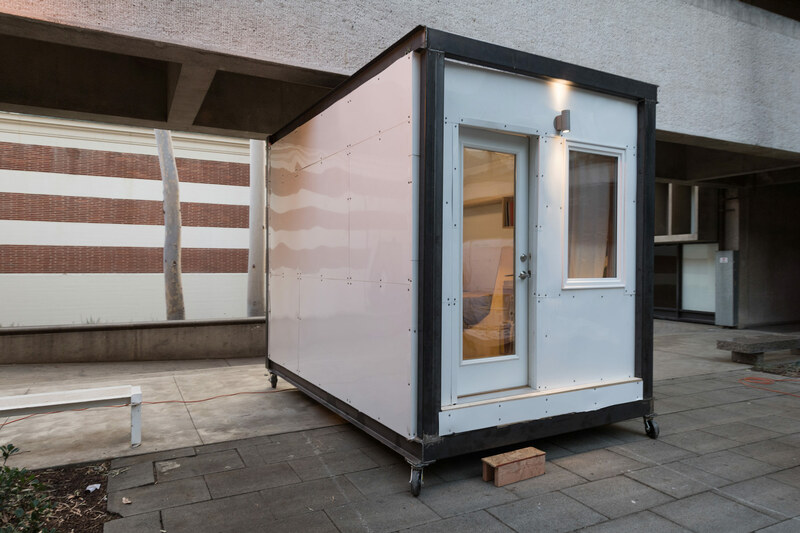 Next, students worked with artist Gregory Kloehn to build single-room “tiny homes” that can be used on a semi-permanent basis. These makeshift explorations are designed with space for a bed and reading nook, and were crafted from found objects including shipping pallets, a truck camper, and even mannequin busts, which were used as shingle siding. Here, the students were able to explore the minutiae of domesticity to a level of intimacy not typically emphasized in undergraduate architectural education. The students designed and built cupboards, countertops, and shelving. The emphasis was on introducing subtle aspects of domestic life for occupants, like threshold conditions that could be used as a type of front porch, beds differentiated from the ground, and, perhaps most importantly, a sense of privacy. 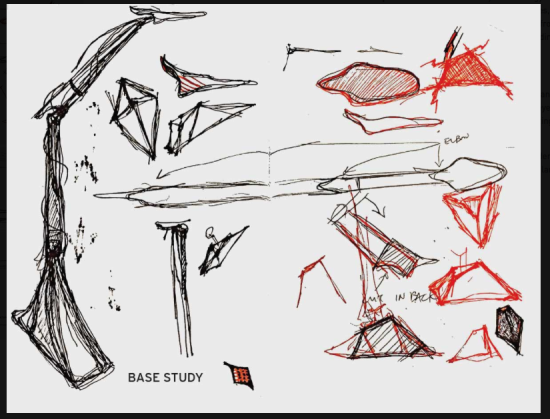 “A quiet space to get stabilized,” explained Borges, who is also acting director of MADWORKSHOP. Next, the class partnered with Hope of the Valley, a faith-based missionary organization active in Los Angeles’s San Fernando Valley area—a region that saw its homelessness population increase by 36 percent last year—to develop a modular rapid-rehousing prototype the organization could deploy as needed. 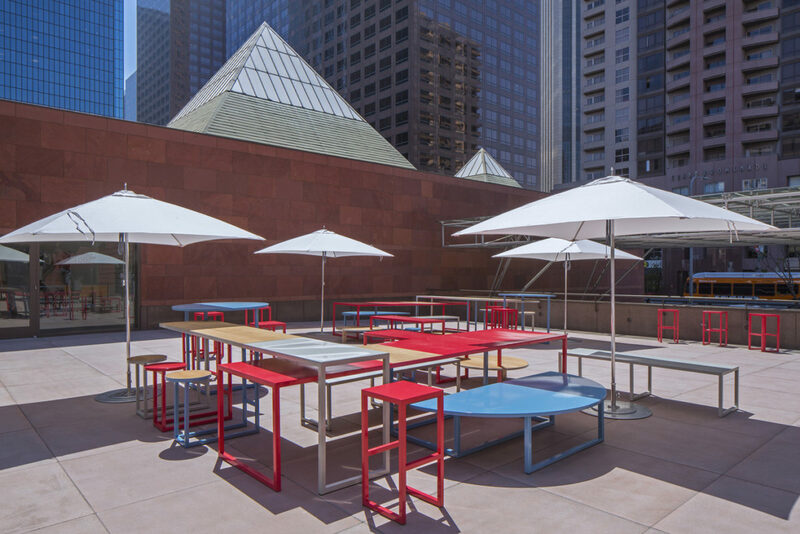 Over the second half of the semester, the class consulted with fabricators, architects, housing developers, and the Los Angeles Department of Building and Safety to develop a series of prototypes that could be deployed in as little as two weeks. Vacant lots, the students postulated, could be used as sites for so-called rapid re-housing approaches, tiered measures aimed at re-introducing formerly homeless individuals to sheltered life. Their plans incorporate existing parking lots, under-utilized land, and potentially, land currently slated for redevelopment but not yet under construction, as sites for these temporary housing projects. The class built a full-scale mock-up for its final review, fabricated using the university’s shop. The result is striking in its efficiency: 92-square-feet of white-walled interiors outfitted with a built-in dresser, bed, and desk made of plywood. The rectangular space is outfitted with a special window assembly on the end opposite the door that has been designed to facilitate passive ventilation. From the outside, the modular nature comes into greater focus, as the welded steel moment frame with structural insulated panels is used to structure the module against the white, surface-nailed exterior cladding made of enameled aluminum sheets. The metal frames are designed to attach to adjacent modules while also providing overall structure to the complex. 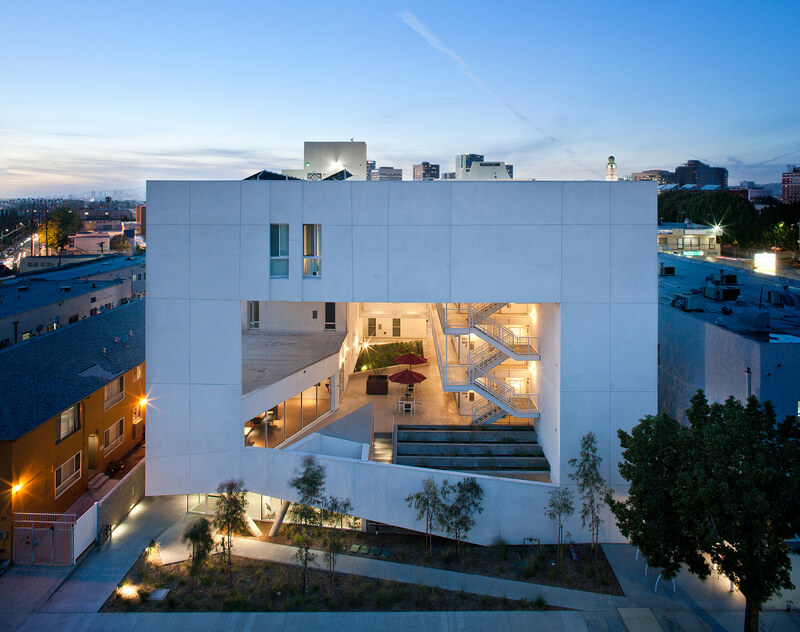 The plans were praised at the studio’s final reviews, which were attended by representatives from Hope of the Valley, Los Angeles Mayor Eric Garcetti’s office, nonprofit homeless housing provider Skid Row Housing Trust, and others. Next, the team plans on moving forward with city agencies to get working drawings for the module approved so the pods can be fabricated and deployed across the city.